Blue Jay by Jake Publicover via Birdshare. The two main things to keep in mind when deciding where to place your bird feeder are: can you see the feeder well, and is the feeder in a safe location. The first of these is easy, but the second takes a bit more planning. You’ll want to make sure the feeder is in a place that’s relatively safe from window collisions and from predators. Perhaps counterintuitively, feeders are safest when they’re closest to windows—because if a bird takes off from the feeder and hits the window, it won’t be going at top speed and has a better chance of surviving. Place feeders closer than 3 feet to a picture window (or even affixed to the glass or window frame), or farther than 30 feet from a window. Window glass kills at least 100 million birds every year in the United States, according to estimates. Here’s more on latest findings in window safety from our magazine. Feeders close to natural shelter such as trees or shrubs offer resting places for birds between feeding bouts and a quick refuge if a hawk flies through. Evergreens are ideal—their thick foliage buffers winter winds and offers year-round hiding places from predators. Be careful not to locate your feeder too close to cover, though. Nearby branches can provide jumping-off points for seed-hungry squirrels and hiding places for bird-hungry cats. A distance of about 10 feet seems to be a good compromise, but try experimenting. You can provide resting and escape cover for ground-dwelling birds such as Song Sparrows and White-throated Sparrows by providing loosely stacked brush piles near your feeders. More about safe feeder placement from Project FeederWatch. Hummingbird feeders should be placed where they are protected from wind; a swaying feeder may spill sugar solution. Also, try setting them where they are mostly shaded, because sugar solution spoils quickly in the sun. When you first set up a feeding station, you may have no feeder visitors. Be patient—the local birds first have to discover the new food source. As with any new restaurant, you may need to do a little advertising to get some clients—if no birds visit your seed feeder within a few days of setting it up, try sprinkling seeds on the ground nearby to make the feeder more obvious. If birds congregate nearby but just don’t come to your feeder, sprinkle seed between the favored area and the feeder. If the seed in the feeder is blowing out or getting wet, it may be too exposed for birds to be comfortable, too. Try moving the feeder to a calmer, more sheltered spot. If birds still don’t come, you may need more bird-friendly plants in your landscaping. You might ask advice from someone who has a successful feeder near you, or try our YardMap website for lots of ideas specific to your region. 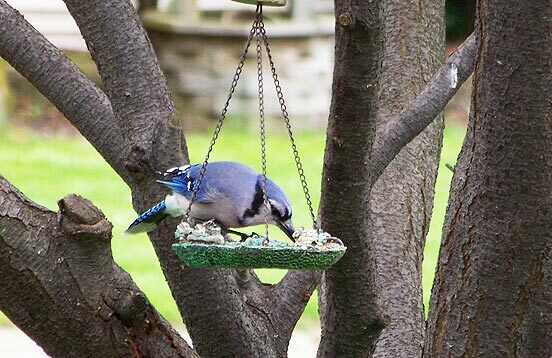 What’s the best way to clean your bird feeders to prevent disease?